The last quarter of 2018 was one to remember for Warner Music Group and its global head of recorded music, Max Lousada (pictured) – not to mention the major’s CEO, Steve Cooper. 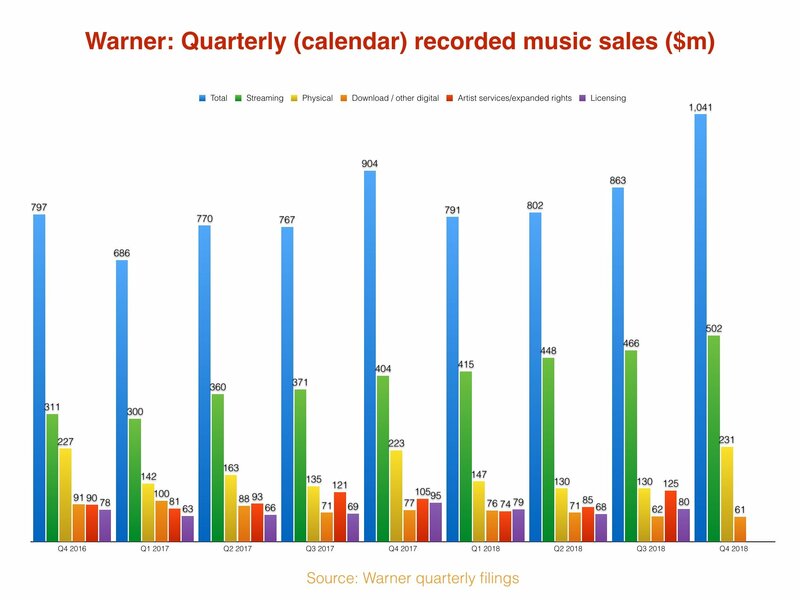 Warner’s worldwide recorded music division posted revenues of $1.04bn in the three months to end of December (calendar Q4, or Warner’s fiscal Q1), up 17.8% year-on-year at constant currency. That number was boosted by $76m of revenue related to the acquisition of EMP, the Germany-based merchandise company and e-tailer which WMG bought in October for approximately $180m. Warner matched the quarterly performance of Sony’s recorded music operation, which turned over $1.039bn in the three months to end of December. According to MBW’s research, it was the first time since public fiscal records began (in March 2005) that Warner Music Group’s labels have surpassed $1bn in revenues in a single quarter. 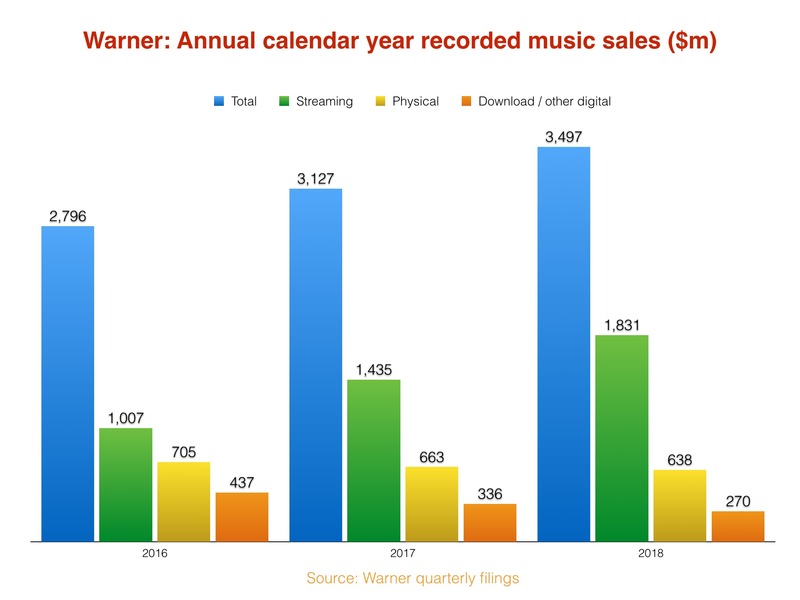 Some 48% of Warner’s recorded music revenues in calendar Q4 came from streaming, which generated $502m, up by $98m on the $404m posted in the equivalent quarter of 2017. Bucking the industry trend, Warner’s quarterly physical music revenues grew year-on-year – no small part thanks to the record-breaking release of a posthumous Johnny Hallyday album in France – up 3.6% to $231m. WMG turned over $1.83bn from streaming in the 12 months of 2018, equating to 52.4% of its total revenues last year. Across all of its divisions – including publisher Warner/Chappell plus recorded music – Warner Music Group posted revenues of $1.2bn in its fiscal Q1 (calendar Q4). This represented a year-on-year rise of 15.1%, or 17.8% at constant currency. The firm’s net income was $86m, versus $5m in the prior-year quarter. The improvement was due to higher operating income and higher other income associated with the Company’s Euro-denominated debt due primarily to changes in exchange rates and an unrealized gain on investment. Recorded Music operating income in calendar Q4 (fiscal Q1) was $163 million, up 26.4% from $129 million in the prior-year quarter; operating margin was up 1.4 percentage points to 15.7% versus 14.3% in the prior-year quarter. 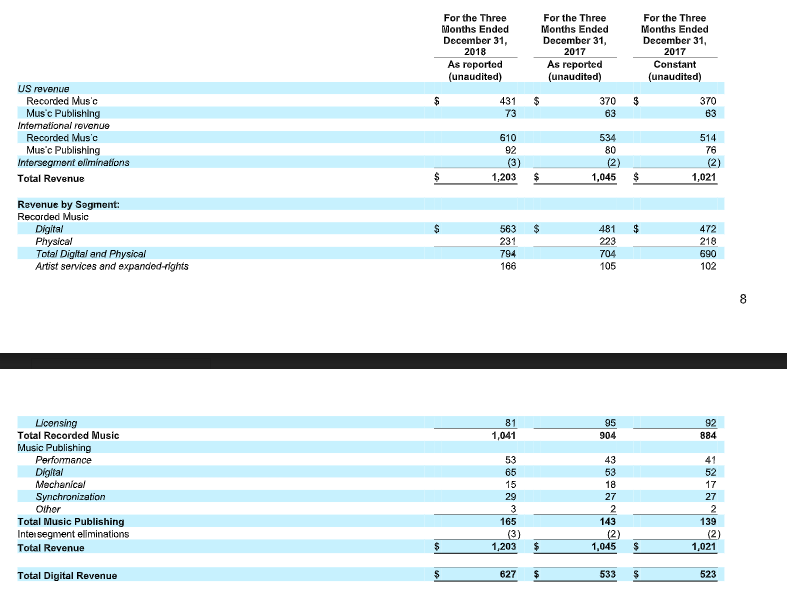 Warner/Chappell saw revenues rise $22 million, or 15.4% (18.7% in constant currency), boosted by the adoption of new accounting standard ASC 606, which resulted in a $26 million benefit. W/C’s performance and digital revenues both rose in calendar Q4, but mechanical revenues fell slightly (-$3m) year-on-year. 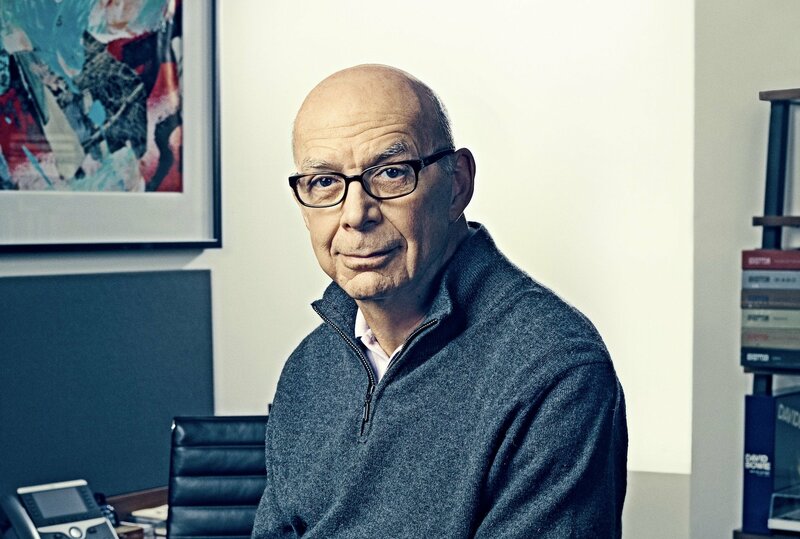 “Our first-quarter results are evidence that our long-term strategy is paying off,” added Eric Levin, Warner Music Group’s Executive Vice President and CFO.